Finally all 16 locking keys and the 8 underwedges that form the joints that hook Phoenix’s field frames to the tangs on her Kamarion and ladder, are completed. That was a lot of fiddling around. Now we can finish welding the Kamarion together and start on the ladder and saddle that hold the stock in place. Deep inside it now. It’s funny how you can you can look at something a million times and not see the deeper truth that lies within it. Let’s take a look at this machine again. The way this machine is set up, it is apparently intended to be an outswinger. Of course, there are no limbs installed. The idea is that the outswinging limbs would retract into the pockets on the curved stanchion, and thereby gain an extra long draw. Here is a photo of a machine by Alan Wilkins that is set up this way. Notwithstanding the ghastly stacking that would result from such a shallow limb/string angle at full draw, there is one very powerful reason why this outswinging interpretation of the artifacts is bogus. It’s really very simple. Flip things around a bit, and the machines seen in these photos could become much more powerful inwingers. All of which means, that with a minimum of effort, Phoenix can be made to be an outswinger as well as an inswinger. I have checked to see if the geometry of the Elenovo artifact can allow this without any kind of alteration, and it does. And so, dear and gentle proponents of the outswinger, ask yourselves which of the two configurations, outswinger or inswinger, would have the better performance? If you have been paying attention to the facts presented in this journal, the answer is obvious. Why would you choose a weaker powered outswinger, with a big old footprint, as opposed to a more compact and powerful inswinger? Especially when the difference between them is so slight as a stock and field frame reversal? If this were a fair debate, and the hard evidence given it’s proper due, the outswinger interpretation of these iron frame ballistas would have been in the ditch a long time ago. (Please note: no one is saying outswingers did not exist. Clearly most of the earlier wooden machines were of that type. Just not the iron frame machines we are studying in this investigation.) In a way though, the outswinger camp does have a point. 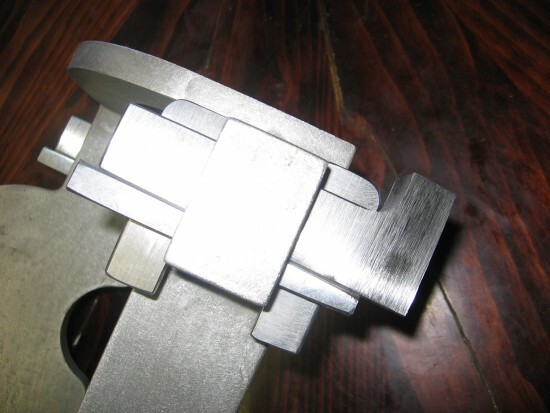 If the attachment brackets and hold down wedges that secure the metal frame to the stock were designed properly, it would be a trivial matter to switch back and forth between outswinger and inswinger. Perhaps the underpowered outswinger configuration was simply a ruse. The inswinger capabilities being a closely guarded military secret. “See, our ballistas are only good for 300 or 400 yards. Unless we knock out some wedges, spin the stock and field frames around and go to town on you at twice that distance.” If the Wilkins translation and interpretation of Heron’s descriptions of these iron framer’s is correct (and that should not be an automatic given) then perhaps the ancient writings were just clever propaganda to fool the gullible. A truly brilliant ruse as it still appears to be operational. Ultimately, the hard evidence is what tells the real story. It would seem Phoenix has just acquired an additional mission. Because the geometry of the Elenovo artifact supports it, she is now going to be a convertible: inswinger and outswinger both. How very Italian! Update: And yet again, nothing is ever quite so simple with historical catapults. The above scheme for convertibility requires the field frames to be flipped end over end in order to match the different length tangs on the Kamarion. This convertible feature should be easy enough to accomplish with Phoenix, the Elenovo reconstruction, because the top and bottom loops on the field frames are all the same size. The Orsova and Lyon field frames have large bottom loops and small top loops. No end over end switcheroo of their field frames is possible. Convertibility is an interesting concept though and should tell us a lot about the relative merits of the two sides in this fracas. I intend to pursue it. Update of the update: And then there is this configuration. One supposes that the idea here is to gain more pre-load on the springs by allowing the limbs to rotate forward into the pockets on the curved stanchion, performing the linear and rotational pre-tensioning in the conventional manner, and then increasing that tension even further by drawing the limbs back through a greater arc of movement (thanks to those helpful little pockets that allowed the limbs to move so far forward), and then, the theory goes, install the bowstring and be off to the races with dynamite velocities. To my way of thinking, creating a curved stanchion to facilitate this strategy is a tremendous amount of extra work and potential hassle to gain just an extra inch or so of pre-load in the springs. If that’s your game, why not just rotate the washers a bit? However, with a few simple switcheroos, Phoenix should be able to test this geometry as well. Having a machine that can explore all the variations possible of how these machines could have been hooked together, and doing so with the same limbs, springs and everything else, should settle this ridiculous debate once and for all. It will still be a tough sale though. Because these outswinging interpretations of iron frame ballistas look so familiar to folks with a lifetime of seeing ordinary bows and crossbows, it can be said that outswingers just “look right”. I feel this effect on myself when I look at a machine like the one by Mr. Wilkins. It is quite handsome and has a comfortable grace and elegance to it’s lines. However, that does not mean it is correct. Unless we are to suppose the Romans were dullards and could not see the high-performance potential so easily available to them within the perfectly adapted inswinger geometry of the Elenovo kambestrion. The easier I can show the conversion between outswinger and inswinger can be made, the stronger the argument becomes for the existence of inswingers. Ripe fruit on low hanging branches always gets picked first. It’s just not credible that the Romans would not have noticed the easy ballistic pickings available to them with the inswinging arrangement. Ultimately, everything is relative. Which is why careful analysis of the artifacts, combined with actual shooting assessments, is a better way to sort this all out. Here is the basic lock up for all the joints on Phoenix’s field frames. The angle on the under wedge is 2 degrees. With the first wedge we hammered home, there was some frictional galling between the wedge and loop. The torn metal was easily filed smooth. A smear of grease prevented it from happening again. Technically, bronze would be a better metal for the wedges as it would never gall against the steel. However, part of our game is to pursue designs that represent simplicity and ease of manufacture for ancient metal workers stationed out in the boonies; forging steel being simpler than casting bronze. And no! hardwood wedges ain’t in the cards. Too many rattles I don’t need to bother with. Cellulose has it’s place, just not at the heart of our souped-up torsion racer. So, iron wedges and a flick of grease would be my tip to the aspiring village blacksmith turned ballista-maker. The balance between easy and superior is not always contentious. At this point in time (and on a Tuesday, no less) I’ve decided an assessment of our current lines of enquiry is in order. (1) Firefly is waiting for another set of matched bolts to be made and a definitive solution to all the bolt breakage that occurs when shooting at mid-range, that is 300-400 yards. Our extreme range testing 0f 800-1000 yards did not have this problem because landing in a soft field is a viable option for bolts descending at a 55 degree angle. Shallow angles that come from flat trajectory fire are more problematic. At fifty yards it is easy enough to make a small rock free dirt backstop, and that works great. However, at 300 and 400 yards the landing zone for my fragile beasties needs to be the size of a small bus. And me, with my bad back and everything. Boo-hoo! Still looking for a rock free (or somewhat free) hillside. The ground will no doubt freeze solid in the next couple of weeks. More testing will probably have to wait till next season. (2) The Sinew Vs. Nylon question needs more work put into it. ’nuff said. (3) Phoenix proceeds apace. I work on her everyday. Soon, things will be seen to happen as several of her major components get hooked together with their permanent accoutrement. All shivery with anticipation, I am. (a) Is a flat-topped crossbar indicative of a wedge machine? Is it’s flat-top a suitable foundation for a pair of counterpoised wedges to drive a spreader bar? (this latter, nicely radiused where it contacts the spring, of course) and by this method put our all-important linear pre-tension into the springs. Because no crossbars were found for the Elenovo machine, I feel Phoenix is at liberty to explore the notion of a wedge machine based on the unique information concerning the crossbars obtained from the Lyon artifact. (b) The crank handle from the Elenovo horde will be duplicated and used in the winch design for Phoenix. (c) Similarly, ferrous tension rods for Phoenix’s limbs will be based on the artifact thought to be one, also from Elenovo horde. (d) Phoenix will make every attempt to balance herself using only a wedge based system, and then we can see if an equally imposed 180 degrees of washer rotation yields the high power we are looking for. This would allow us to dispense with the vernier plates and make some sense of the coarse washer adjustments evident of the Lyon machine. Power and simplicity is our signpost from the Romans. Nothing else will do. (4) Although I haven’t mentioned it yet, plans are afoot to make a reconstruction of the Lyon machine. To demonstrate the simple and forgiving nature of the iron frame design, this machine will be made with more rough and ready blacksmithing techniques. An ugly machine, with much lower standards of fit and finish, yet undiminished in her power and accuracy. At least, that would be the goal. Deliberately making misshaped and unsymmetrical parts fit solidly together into something wierdly wholesome and impressive is a personal challenge I am looking forward to. I believe that the basic Roman design was so good it could accommodate more ad-hoc forms of manufacture. In other words, iron frame ballistas were a reliable manufacturing concept that could be exported to all corners of the Empire and then made locally. Crudity of manufacture does not necessarily belie reliable performance if the basic design is forgiving enough; witness the Kalashnikov. The Ak-47 is rarely revered for the prettiness of it’s workmanship, and yet as an effective and exportable concept it has become renown for it’s robust simplicity and ease of manufacture in third world conditions. So, that will be our take on the Lyon machine. 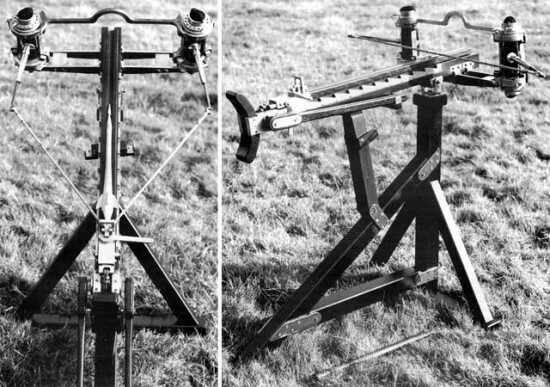 An easily made inswinger, miles ahead of the competition when it came to long range precision work. 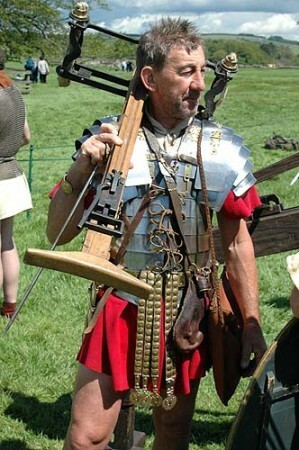 From this distant remove, 1700 years after their common usage, ancient ballistas are mechanisms that defy modern attempts to categorize them absolutely. However, there are traces of the mechanically irrefutable about them, if we have the wit to know what to look for.